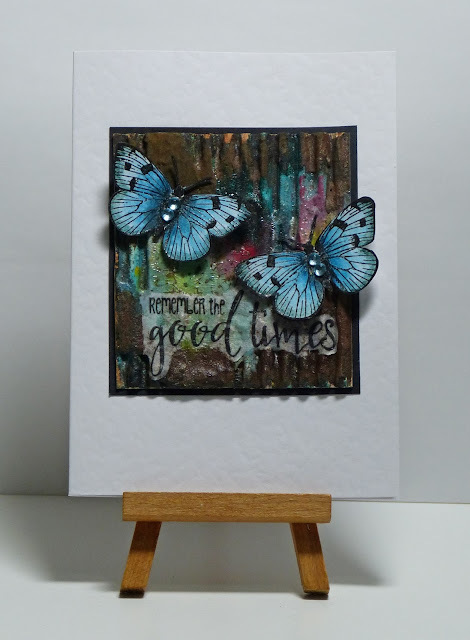 Cathy's Card Spot: Rust, distress paint and crackle medium = Mixed Media Experiment! 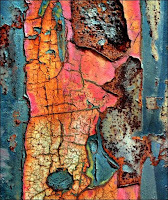 Rust, distress paint and crackle medium = Mixed Media Experiment! Hi everyone, I wanted to try something a bit different with rusting powder. I've used it on corrugated card scraps before with distress spray stains, but wanted to add some colour into the mix. My family are quietly reserved in their opinions lol, but I quite like it! I painted on a few distress paints and watered them down so they ran on the card. Next I thought I'd add some clear rock candy crackle paint.When that too was dry I added multi medium matte to spots and sprinkled on the rusting powder. Tapped off the excess, then sprayed with vinegar. Some ended up in the cracks which was ok by me. I stamped and embossed the sentiment onto tissue paper and used multi medium matte to glue it on. The butterflies are coloured with Inktense pencils as I just thought it needed something else, well, butterflies! This was my inspiration pic from the PaperArtsy Challenge, rustification. There are so many great projects from the DT too but I just love this pic! I'm also adding a link to the creatures great and small challenge at Simon Says Stamp Monday. I really like the added color to the rust look. It adds a patina to the card. The corrugated piece adds depth and the color running down gives interest. You captured it all. Love the texture you've gotten here. Love the whole project. Love your rust treatment, and the colours you have used Cathy. The corrugated card background is wonderful! I think it looks awesome!!! nice job!